This is to convey my gratefulness to the support you rendered to make me get my great car. I managed to get it last week and I am enjoying it. It is sincerely a great car. Thanks a zillion, may the Almighty bless you with many more customers. I will definitely keep linking people to you. The vehicle itself was also received in good condition and it is running well now. I hope to come back for another if I find some money. Thanks you so much for all your help so far Juan, I really appreciate it. I will await your email in relation to confirmation of shipping and will definitely be referring your company to my friends and family. had received my vehicle from your company on 29th August 2011 which is the date I release my vehicle from the wharf and custom department. I will take a photo of mind with the vehicle and post on my next email. Once again thank very much and appreciate your services. September I enjoying the NISSAN ATLAS safely. Now I'm encourage other friends to joint the team. How are you this moment . Maki this is the picture for HENRY N. with this vehicle and im enjoy the car my friend. I am writing to tell you that I have received the vehicle and I am so happy for it. I am sorry for my lack of English. I am Ronald from Air Water Earth Limited. 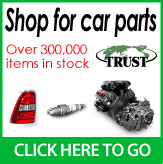 We received the two vehicles we bought from Trust last month and are in good condition. Recevez mes felicitations pour la qualite de vos services. Je confirme l'arrivee avec succes de ma voiture mazda capella wagon dans mon beau pays la RDC.c est vraiment impecable et ne cause aucun probleme. C est tres facile a confondre avec une mercedes.Dans peu de jours vous aurez les photos de ma belle voiture.Merci et felicitation a votre agent deddy Tanga. and therefore wish to thank you tremendously for such a smooth transaction. Finally my sincere gratitude once again and looking forward to my next purchase of another Range Rover. I just want to confirm that I got this car and I’m happy with its condition, the engine the body inside and outside and the performance of the engine is excellent. Toyota GAIGA from KITWE. After I have done our local registration to start using it on the road I will definitely send photos as promised. Hope you are fine. The car arrived safely and intact! Thanks for the good service. Please keep it up. Hi Yuki, this our my mom enjoying her Airtrek in Kenya. She loves it; it runs good and is happy about the results. this is to inform you that i have already received i purchased from you. thanks a lot for excellent services. I am pleased to inform you that my vehicle arrived safely, I congratulate you for a job well done. [...] I thank you. We are ecstatic about finally driving our car, we got it in perfect shape and we are grateful doing business with you and Trust Company. we are now always advertising for you guys for such an excellent service. May God Bless you richly. Thanx, I received my vehicle in perfect condition.